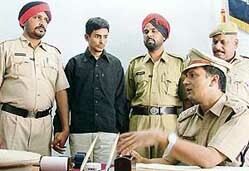 The Army-deserter cook, who had allegedly taken 24 girls to Goa on the pretext of getting them recruited as nurses in the Indian defence forces, had weaved the entire plot on his own and no official of the Army has been found involved in it so far. Some unidentified persons robbed a 26-year-old youth late last night in Jamalpur before they shot him. 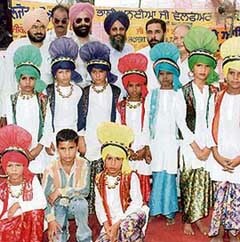 The bhangra team of Government Primary School, Pandori, with Mr Bawa Singh, former Vice-Chairman, Minorities Commission, and other dignitaries. Guru Angad Dev Veterinary and Animal Sciences University (GADVASU) has decided to set up a dairy science college. This was decided at a meeting of the Board of Management of the university held here yesterday under the chairmanship of the Vice-Chancellor, Mr D.S. Bains. The environment is degrading with each passing day, but farmers continue to keep their eyes closed while setting paddy residue in their fields on fire. The police today fished out the body of a middle-aged man from Neelon Canal. He was allegedly murdered by some persons over a money dispute on October 31. The city Mayor’s “political rally”, which was organised in the garb of the inauguration of elevated road, has cost the public exchequer Rs 5 lakh. The expense would be borne by the Ludhiana Municipal Corporation. Sky-rocketing prices of vegetables would take at least 10 days more to normalise a bit with an expected increase in supply. 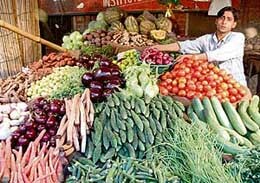 City residents have been quite disappointed as vegetable prices have continued to rise even after Divali. A nagar kirtan was taken out here today to mark the forthcoming Parkash Utsav of Guru Nanak Dev, falling on November 5. The Mohalla Development and Welfare Committee, Jagraon, has submitted an application to the Chief Minister regarding the proposal of constructing a rail overbridge on the Tehsil road here. Photographer Rakesh Syal of Ludhiana has won the second prize for August in the prestigious photography contest sponsored by betterphoto.com, the site's founder, Jim Miotke, announced yesterday. This is the 12th time he has won an award for his photographs. Under the aegis of the Horticultural Society of India and PAU Horticultural Science Society, a panel discussion on “Horticulture Development in Northern India - Changing Priorities” will be held at Wheat Auditorium on the PAU campus on November 6. The local Ramgarhia Girls College, Miller Ganj, in collaboration with the Shaheed Memorial Seva Society, organised a function to honour eminent persons for their contribution in respective fields. Mr Vajinder Singh, secretary of the society, and Ms Harmit Kaur, Principal of the college, presided over the function while Mr Gursharan Singh, playwright, was the chief guest. Students of Guru Nanak National College, Doraha, excelled in M.Com, IInd semester, examination, conducted by Panjab University, Chandigarh, by scoring 100 per cent results. Ms Jasdeep Kaur has been awarded the prestigious "Dr R.N Thapar Gold Medal" for being adjudged the overall best graduate of Punjab Agricultural University, Ludhiana, for the year 2005. The cultures of Poland, Bulgaria and Punjab came together on one stage at “Punjab International Folklore Festival” at the Government College for Women here today. 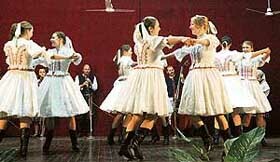 In the jam-packed auditorium of the college, around 47 Polish and Bulgarian artistes performed. A team of doctors, headed by Dr Gurdip Singh Sidhu, Director and Chief Surgeon of Sidhu Hospital, performed a rare surgery of a condition called situs in versus totalis in which the organs of the body were transposed to the opposite side of the patients body. A free medical check up camp will be organised by a team of doctors from Dayanand Medical College and Hospital and Hero DMC Heart Institute, in association with Krishna Breast Cancer Charitable Trust, at Rupalon village near Doraha on November 5. The annual athletics meet of Guru Nanak Model Senior Secondary School concluded at the Guru Nanak Stadium here yesterday. Chennai zone trounced South zone by 128 runs to register their second consecutive victory on the second day of the sixth All-India United India Insurance Company Limited Cricket Tournament, being played at Punjab Agricultural University, here today.